A strange title for a bittersweet love story. 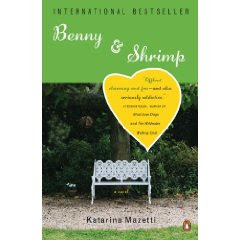 Benny and Shrimp (real name Desiree) are both middle aged and lonely. Benny is a dairy farmer who never went to college while Shrimp is a librarian and an avid reader/philosophizer. They meet in a cemetery and fall in love, only to realize that perhaps the passion they feel towards each other may not necessarily carry their relationship into the future. The best relationships are founded on compromise, but are the two willing to sacrifice parts of their lives for each other? A quick read, but a thoughtful one at that.